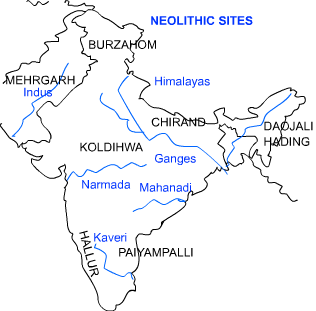 Neolithic Age: The last phase of the Stone Age is called the Neolithic Age. This phase began about 10,000 years ago. This phase marks a significant change in the life of humans because this is the period when man began farming. Tools of the Neolithic Age: The tools of the Neolithic Age were much smaller and more refined. Stone was given better shape and some tools were fitted with handles, e.g. spears, axe, sickles, arrows, etc. The beginning of farming was the most revolutionary development in the human history. This marked the beginning of progress towards a settled life. Historians guess that farming was first discovered by women. This was possible because women had to live at a place for a longer duration during pregnancy and raising children. While staying at a place for a long duration; women and children may have observed that seeds develop into plants. They may have learnt growing plants after that observation. Farming meant there was better supply of food. Additionally, there was less reliance on hunting and gathering. We know that a plant takes many months to bear fruits and seeds. So people needed to stay at a place for longer duration to take care of the crop. This helped humans to live a settled life. Once food was surplus, people could focus intellectual development during their spare time. This helped in developing scientific, linguistic and artistic skills. After the beginning of settled life; communities became bigger and eventually took the form of villages. It is important to remember that a village is a place where agriculture is the main occupation of people.